Guest blogger Suzie Cunliffe invites us to her five favourite foodie spots in the picturesque harbour town of Porthleven – whether you want a quick coffee or a fabulous five-course meal there’s something for everyone. Stop off at The Brew House for morning coffee that’s roasted just a mile up the road and expertly brewed by baristas on-site. 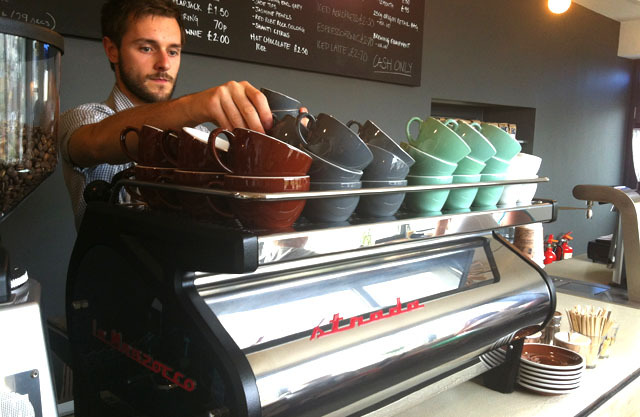 This is the showcase of Cornish coffee company Origin and that means they’re ultra-serious about the quality in your cup and offer two filter and two espresso coffees each day. If you’ve time you can even stay and try them all, brewed using different methods. I love to take away a fresh cup and take time to sit and sip, watching the world go by. Sister restaurant to the Victoria Inn in Perranuthnoe, The Square is a relative newcomer to the Porthleven foodie family but it’s established itself firmly as one of my favourites. I’ve eaten at The Square with friends, with family and with my partner and we’ve never had a bad course. Brasserie-style food is beautifully presented, tastes amazing and portions are a good size to allow you to eat three courses (try their three-course deal if you’re on a budget) and sample everything on offer. Over 60’s lunch on a Thursday is a real bargain at just £8.95 for three courses and dining al fresco is a delight in the warmer months. If you’ve got the kids in tow then head straight for Kota Kai where they’ve got a games room complete with a skittle alley to keep the little ones entertained – we went for my friend’s toddler’s first meal there and managed to sit for about an hour and a half and enjoy a three course meal. She reliably informs me this would have been impossible in most restaurants. There’s even a free kid’s meal with every adult one between 5.30-6.30pm. Laid back atmosphere, unbeatable views and an Asian-influenced menu with lots of off-season delights for adults too, including amazing Asian nights, film nights and some fabulous cocktails. 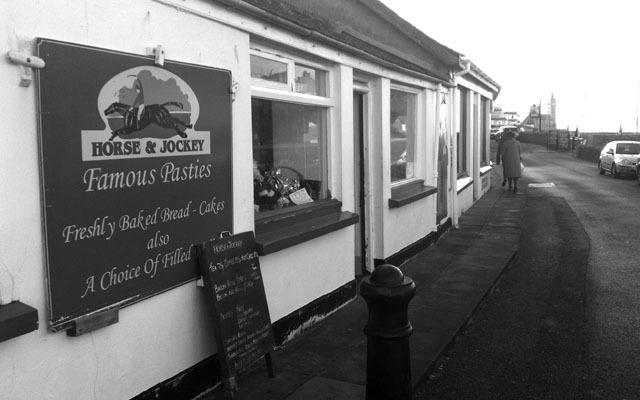 If your stomach’s rumbling at lunchtime then a pasty from the Horse and Jockey is a well-kept local secret. I can confidently say this fabulous filler is one of the best you’ll find in Cornwall (and I’ve tried a few!). My tip is to go for the flaky pastry option – and if you can take a friend along then buy a large pasty between you. That way you might still have room left for cake afterwards! Top of the shop for customer Reviews on Trip Advisor, you’ll need to book early if you want an evening meal at this kitchen café as as the limited number of covers mean it’s always in demand. Turquoise 50’s style diner chairs and a huge log fire that is lit up during the cooler months make this a bright and relaxed space that can be enjoyed at any time of day. Serving locally sourced food, this is a great place to stop for a hearty brunch or a slice of cake (try the Chocolate Orange). Tuesday is steak day and Thursday is fish day with special offers on meals and wine combos. Suzie graduated with an MA in Professional Writing from Falmouth University in 2012 and works as a freelance writer in Cornwall. Find her on Twitter @SuzieCunliffe.